Having anticipated the implosion of the Chinese cinema bubble – as we predicted here and here – and at a time when commentators were falling over themselves to predict how soon China would overtake North America as the number one movie market in the world, our predictions came true in 2016. All the tell-tale signs that were previously highlighted, such as an inevitable end to e-ticket subsidies, restrictions on domestic content, rampant fraud and more, came together in a perfect storm causing China’s box office growth to stall. Yet the full scale of this crash (the polite word is ‘slump’) is still not apparent to most Western observers, nor are the future implications. Western trade papers are pussyfooting around the crash with headlines like “China box office growth declined sharply in 2016” (Screen Daily) and “China Box Office Crawls to 3% Gain in 2016” (Variety) while the financial press was more honest with “Stalling Chinese box office raises Hollywood fears” (Financial Times). It is only in China’s own press that the full truth is being acknowledged with headlines such as “How bubble burst on China’s cinema industry ‘boom’” (Hong Kong’s South China Morning Post) – note the inverted commas around the word ‘boom’. In an earlier article SCMP was even more explicit in referring to China’s “silver screen bubble“. Because the box office crash, not ‘slump’, is very real. In this post we will look at what lead to the crash (as we predicted), what the actual situation is and finally what the future prospect for the Chinese cinema market is. A ‘hidden’ decline in the growth rate of the box office. Let us look at each one in turn to see how they came true in the past year. By 2015 it was obvious that the low hanging and plump fruits of exhibition had already been picked, with modern multiplexes and IMAX screens saturating major urban markets (Beijing, Shanghai, Shenzhen, etc) and also Tier 2 cities that you have probably never heard of: Shenyang (8.2 million people), Wenzhou (6.6 million) and Changsha (5.2 million). Expanding into Tier 3 and 4 cities yielded diminishing returns as ticket prices had to be lowered to attract their less affluent inhabitants. 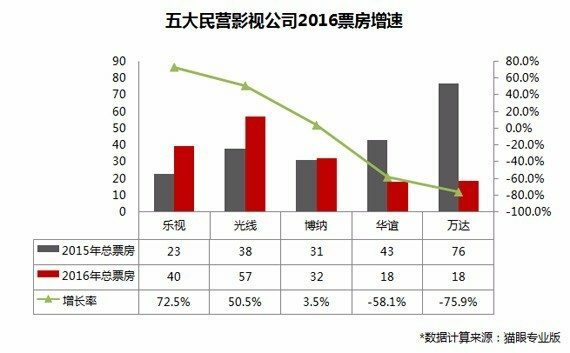 In 2016 the average ticket price in China fell to CNY ¥32.9 (USD $4.73) from CNY ¥34.8 (USD $5.01) in 2015, according to data from EntGroup, a Chinese firm which tracks such figures. The consolidation of mobile ticketing platforms was other big story of Chinese cinema in 2016. With the likes of Cat’s Eye or Guevara ticketing platforms having either been acquired or sidelined by internet giants BAT (Baidu, Alibaba and Tencent), often working in close partnership with the largest Chinese cinema chains, there was less need for crazy CNY ¥9.99 (USD $1.43) ticket promotions. This lead to less impulse purchases and speculative viewings, when people were happy to watch whatever was playing, and meant Chinese audiences became more selective. In 2015, people still treated the cinema as a place mainly for entertainment and did not care much about the actual content of films they watched. But they have wanted more this year – they are clearer about their taste in films. – Wang Zhonglei, head of Huayi Brothers Media, speaking to Oriental Outlook magazine. Chinese audiences thus evolved the same way Western audiences did in the 1940s and 50s, when cinema tickets were cheap and cinema visits were weekly, through the 1980s and 90s when multiplex prices appeared. In China however this evolution occured in the span of months instead of decades. Jackie Chan’s “Railroad Tigers” didn’t roar at box office. But the greater story here is the number of foreign films released on a flat-fee basis in China. Though no reliable statistics have been released, anecdotal evidence suggests that the number was up significantly year-on-year. Yet despite all this, the panic quota increase could not save the 2016 Chinese box office. Official increases after 2017, when negotiations about the new quota begin, should not be expected to significantly improve Chinese cinema’s box office fortunes. Much has been made of the monster-size hit that was Steven Chow Sing-chi’s “The Mermaid”, which overtook “Monster Hunt” as the biggest domestic Chinese box office hit ever. What fewer industry analysts noted was that Chow is a film maker from Hong Kong, which has traditionally had the freedom of a larger creative pallet than Mainland directors. Similarly “Monster Hunt” director Raman Hui learned his trade at Dreamworks Animation. This is not to say that Mainland film directors are without talent, but that they are often stifled creatively by self censorship and restrictions imposed by the Communist party (e.g. no time travel or ghosts stories, no subject that implies corruption by officials, etc.). In 2016 Chinese audiences grew bored with broad comedies and re-tellings of ancient sword fighting legends. It speaks to the low quality of the domestic output when the summer’s biggest hit in China was Hollywood flop “Warcraft”. So at current trends and even assuming minimal growth to the US box office for the rest of the decade, it will not be until 2020 or later that China overtakes US in total box office spend. But this is on the assumption that Chinese box office growth will not de-accelerate further, which is what the previous indicators point towards. In 2016 this de-acceleration kicked in with a vengeance. We could also add in further factors that we have been highlighting in the past year (here and here), such as the ‘ghost screenings’ (producers buying up all tickets for multiplex midnight shows) that inflate box office, outright fraud by managers through dual ticketing systems and other shady industry practices that distort the overall box office picture. Thus, 2016 was a prefect storm when all five factors came into play at once. But even here the full scale of the current situation is not obvious, as we will examine next. 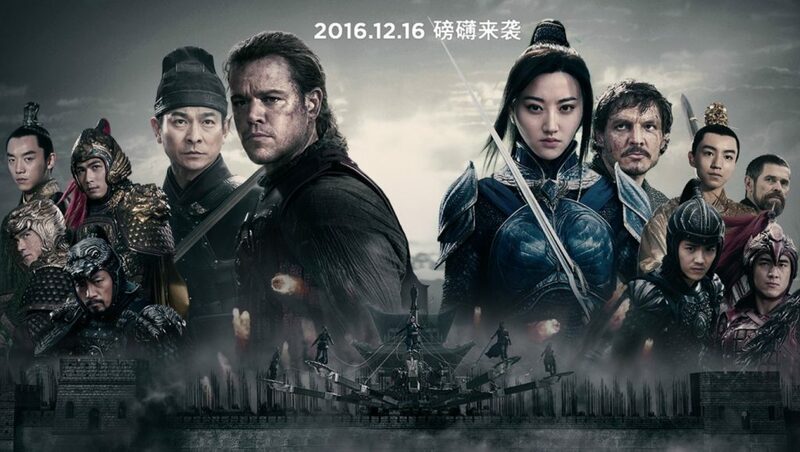 Released in mid-December, “The Great Wall, a Chinese-US co-production proved to be too little, too late. Taken as a headline figure the 3.73% growth year-on-year, with total box office of CNY ¥45.3 billion (USD $6.5 billion), does not seem catastrophic when compared to the US box office that narrowly avoided a decline in 2016 with USD $11.4 billion revenue. But in dollar terms China declined 3.5% from USD $6.76 billion (end of 2015 exchange rate) to $6.52 billion (end of 2016 exchange rate) as the dollar surged and the Chinese yuan fell. More significantly, the previous year box office in China has recorded an official growth of 49%, which led pundits to predict that China was about to overtake the US box office imminently. But as Variety’s Asia correspondent Patrick Frater (one of the more levelheaded journalists covering this market) noted recently, “The 2017 target figure, so widely used at the beginning of the year, now seems not only wildly optimistic, but also to have misunderstood the dynamics of the market.” Indeed. It wasn’t just industry pundits boasting their predictions. The Chinese state itself was the biggest cheerleader of cinema, having expressed confidence that the industry would top CNY ¥60 billion (USD $8.63 billion) by the end of 2016, in maybe the clearest example of keep-drawing-an-upward-line type of financial ‘analysis’. Instead there were mutterings at this year’s CineAsia that Chinese officials were quietly trying to revise downward the previous year’s box office statistics in the hope of making this year’s abysmal haul seem less bad than it really was. But it is only when we break down the year on a quarterly and a monthly basis that the sheer grimness of the situation becomes apparent. Based on EntGroup data we can see that seven of the 12 months of 2016 were lower than the previous year, including the four last months. If you remove “The Mermaid” the total box office would drop by 8.5%, meaning instead of 3% growth China would have seen a 5% year-on-year decline. It is worth noting, even with “The Mermaid” domestic films accounted for 58.3% of the market, compared to 61.6% the previous year. But of the Top 10 films, only two were wholly-Chinese, three were US imports, while three were Hong-Kong-China co-productions and two were US-China co-productions, including “The Great Wall” that was a rare bright light at the of the year. There will be a lot of hope pinned to Hollywood franchises, as well as Tsui Hark’s sequel “Journey To The West: Conquering the Demons 2”, the Jackie Chan vehicle “Kung Fu Yoga” and the “Buddies In India” sequel to the hit “Lost in Thailand”. Chinese authorities did respond to the poor quality of domestic films in 2016 – by attacking “grossly inaccurate” reviews on social media websites Douban and Yanmao. Communist party paper The People’s Daily accused the sites of damaging the “ecology” of the Chinese film industry, which prompted the sites to withdraw their Rotten Tomatoes-like function of amalgamating critics’ scores. When critic He Yan wrote an article defending Douban’s ranking system it was promptly removed by censors. What has not been reported widely in Western media is the impact the implosion of the ‘silver screen bubble’ has had in China on those most immediately affected by it. Korea’s Yonhap News however did report that “Wanda Cinema fell 55% last week and IMAX China fell 30%. SMI Holdings’ share price fell 23%.” If Regal, IMAX North America or 20th Century Fox fell by this much in a week it would be front page news in mainstream Western newspapers. Sadly, too little attention is still paid to financial fundamentals in China by outsiders. As big as the slump in China’s box office sales seems, this is actually the real situation of the Chinese film industry. I said in 2015 that the bubble would burst if we deducted all the ‘ticket subsidies’. How is it possible for the film industry to grow at more than 40 per cent growth for three years in a row when the country’s economy is expanding at about six per cent annually? From this angle, Wanda’s investment overseas can be seen as a prescient anticipation that the Chinese market would eventually run out of steam. One thing that did rise in 2016 was the number of screens in China, with 41,179 screens at the end of the year, making it the world’s largest market in terms of screen count, having overtaken the US’s 40,759 – though as Patrick Frater pointed out, “data from the Motion Picture Association for 2015 showed North America (U.S. and Canada) with 43,661,” which is what China is usually benchmarked against for box office. What nobody has pointed out, though, is that on a per-screen basis, box office declined from CNY ¥1.39 million (USD $200,000) per screen in 2015 to CNY ¥1.1 million (USD $158,00) per screen in 2016, which is a 21% decline. Next year it will very likely slip to an average of less than a million yuan per screen. This is a result of Tier 1 and 2 city audiences becoming pickier and going to the cinema less frequently, while Tier 3 and 4 city audiences are neither prepared nor able to pay the prices that people in Beijing or Wenzhou can splash out on IMAX or 4DX screens. With the exception of Wanda, which houses multiplexes in its own malls, it will become challenging for many cinema operators to pay their rent at this rate of decline. This means that the industry is likely to see some significant consolidation. Chinese film market consultant Liu Jia observes that “as the number of screens continues to grow rapidly, the restructuring of the cinema market will accelerate the pace of mergers and acquisitions. Scale, especially intensive management may help the theater and the screen input and output.” Liu also says that Chinese cinemas must overcome the bottleneck that lead to 944 Chinese films being produced in 2016, but less than half of these got released in cinemas. In the short term, however, the merger-mania that gripped the Chinese media market in 2016 has also slowed dramatically, due to the falling valuations of companies affected by the cinema crash. If China overtakes North America, it is unlikely to hold the title for long. The fall in the Chinese box office this year is a warning that the new heart of the country’s economy—consumer spending—is already showing signs of exhaustion. Yet one of the as-yet not mentioned reasons attributed to China’s box office crash in the past year should set alarm bells ringing all across Hollywood. EntGroup’s film industry consultant Nathan Jin points to the popularity of video streaming websites that showed films within a week or two after the end of their cinema run. “In the past, people had to wait for months before the films were on the internet. Now this waiting period has been largely cut.” Hollywood would be wise to learn from China before thinking that there is money to be made by shortening the home window further.